Today's airtight homes and offices beg for fresh air. When we trap the heat, excess humidity and indoor pollutants such as cleaning products, smoking and pets, will negatively affect the quality of the air we breathe, making our environment both uncomfortable and unhealthy. The ventilation code for new construction requires the installation of a system to provide adequate fresh air. During winter, the incoming fresh air is at too low a temperature to be comfortable and requires preheating. It is more economical to preheat the incoming air at a specific, controlled source than requiring the central system to continually compensate for heat loss. When the fresh air required is 100 CFM or less the new THERMO-X-AIR mini fresh air make-up offers the optimum solution at the lowest total cost. The THERMO-X-AIR mini fresh air make-up is designed to complement your heating system by pre-heating this fresh air, thus continuously providing comfortable ventilation throughout the house. Equipped with the most advanced modulating controller and air sensor, the THERMO-X-AIR mini fresh air make-up uses the minimum amount of energy required to meet your needs. 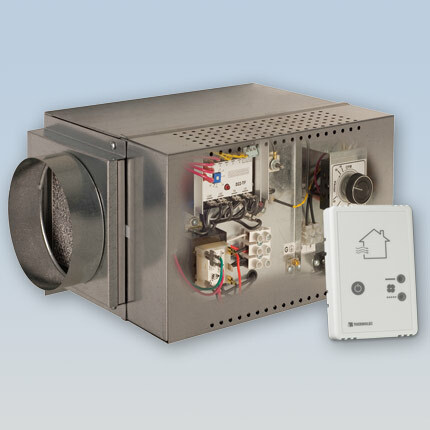 The air flow sensor detects the amount of air flowing through the unit and modulates the heating capacity accordingly, maximizing savings. The THERMO-X-AIR system is a quality product engineered for peak performance, low operating cost and long life.